What Happens if a Cactus Turns Black? As the term cactus includes a large number of varying cacti species, there exists a significant number of fungal diseases and bacterial problems that can cause the flesh of a cactus to turn black. Weather also plays a part, when freeze damage wounds the cacti to the point that its tissue has trouble regenerating. A cactus that turns black may have suffered freeze damage. As many cacti originated in frost-free climates and are now planted in climatic zones that stretch their comfort levels, cacti are sensitive to freezing temperatures. The cold, however, typically must persist for several hours for the injury to occur. When it does, the injured, blackened area will dry out over the course of several weeks and take on a sort of crispness. In many cases, the injury is only aesthetic and the cactus will regenerate its tissue over time. Phyllosticta pad spot is a fungal disease that causes black lesions to appear across a cactus. These black spots are large collections of the reproductive, fruiting bodies of the disease. The entire pad surface of cacti may become blackened with phyllosticta pad spot. The infection may be more severe on the lower section of the plant where humidity is higher, but once the pad dries, the fungus becomes inactive and the lesions disappear. Severely infected pads or plants should be removed to prevent spread of the fungus. Black, sunken areas that are soft and waterlogged are symptoms of infection of a fungal crown rot disease that afflicts several species of Echinocereus cacti, in addition to pad cacti. Caused by the pathogen helminthosporium, this crown rot normally initiates on the upper part of the cactus and produces an internal rot, in addition to the rotting of the pads of pad cacti. Fungicides can help to prevent this disease, but infected plants should be removed and destroyed. 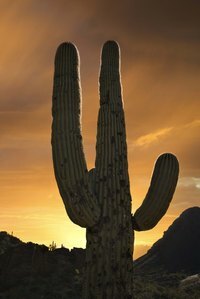 The saguaro cactus can face an onslaught of the disease known as bacterial necrosis. This problem first displays as small, lightly colored wet spots on the cactus before worsening into an intense, dark brown or black rotting of the tissue beneath the infection site. As the disease worsens, the tissue cracks and a dark, brown liquid oozes from the plant. The infection sneaks into the saguaro via wounds along the trunk or branches and is capable of existing in the surrounding soil for a lengthy time. Insects also transfer the bacteria.